2017 was a turbulent year for media streaming players, and Kodi is no exception. To end the year 2017 in a fashionable manner, Kodi has announced coming full circle to external drives. This means Kodi on the Xbox One is possible to use. This blast coming at the very end of the year 2017 includes a nostalgic reference to the past, and many have been asking when the Kodi on the Xbox One will be available. But, because of its long history, the Kodi’s past on the Xbox One deserves a mention. About 15 years ago, a group of enthusiastic developers released something that was called Xbox Media Player (XBMC). Back in the day, the Xbox stood for one of the most affordable devices that were relying on the x86 architecture with TV-out and included an optical drive. It eventually became more sophisticated, including the Xbox Media Center at some point. In the meantime, other gaming platforms were added besides the Xbox, leading to a more competitive game where the hardware continued to evolve and became cheaper. The Xbox started getting behind and became kind of obsolete. This resulted in XBMC being installed on other platforms as it was much easier and more practical than to do it on the Xbox One. The years passed, so did the high hopes for getting Kodi (XBMC) running on newer Xbox versions. However, Kodi on the Xbox One is no longer nostalgia but reality. 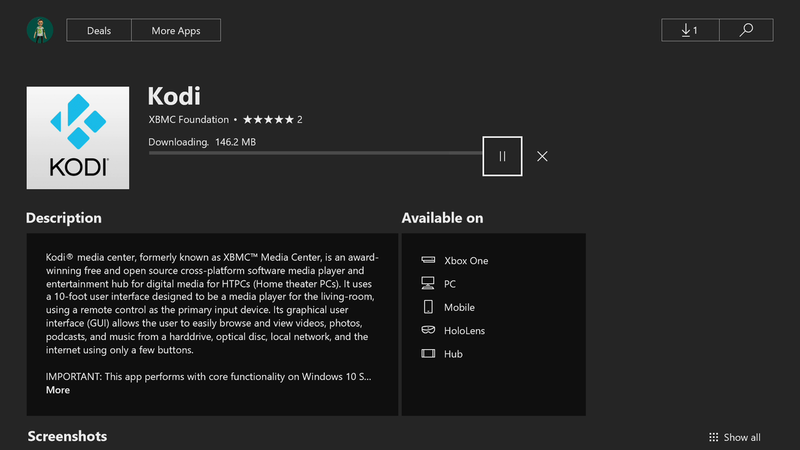 For some perfectly useful and for some sketchy, Kodi is once again available to download on your Xbox One. According to the newest changelog, Kodi is restricted in the region of Europe but should be available as soon as possible. Kodi has announced version “18.0-Alpha1” for the Xbox One, providing the console owners a streaming option. Despite looking similar to the Windows 10 and other versions of the app, this version is still under construction and may be unstable for a few reasons. In addition, the official blog post from Kodi also suggests that it may contain bugs and missing features. The app is still in early stages of development and that it is still fraying around the edges. For this reason, it may not be as stable as the regular version in spite of migrating the code to the so-called Universal Windows Platform (UWP). At Kodi’s, the team was aware of the potential limitations when the work started. However, this didn’t keep them back down when it comes to realizing the dream of becoming once again available on the device that started it all. This keeps them going and they are already working on the upcoming V18 release, creating a perfect opening for the year 2018. If you are eager to try out the early alpha app, it’s now available on the Xbox One store. If you are eager to leave a comment, don’t hesitate to do so as we would like you to share your train of thought with us.